All of the vaccines on the childhood schedule are important. Vaccines are not made for trivial diseases that are easy to treat – every single disease preventable by vaccination can cause immense suffering, pain and grief. The old adage ‘prevention is better than cure’ has never been truer for vaccine preventable diseases; once contracted, often there is very little that can be done to cure or speed up recovery – the only thing that can be done is offer life support where possible, and wait and hope that the body is strong enough to survive to live through it, and strong enough to heal afterwards. Once you, or your family, get sick it’s too late. Only then might you realise that the vaccine you didn’t get was the one you really needed. When your baby is dying of pertussis (whooping cough), or the agonising muscle spasms of tetanus are breaking their bones, you will think that DTaP is the most important. By then it is too late. 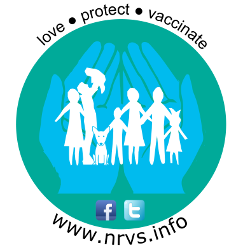 When your child’s hearing and limbs are taken by Meningococcal or pneumococcal disease, you will think that those are most important. By then it is too late. 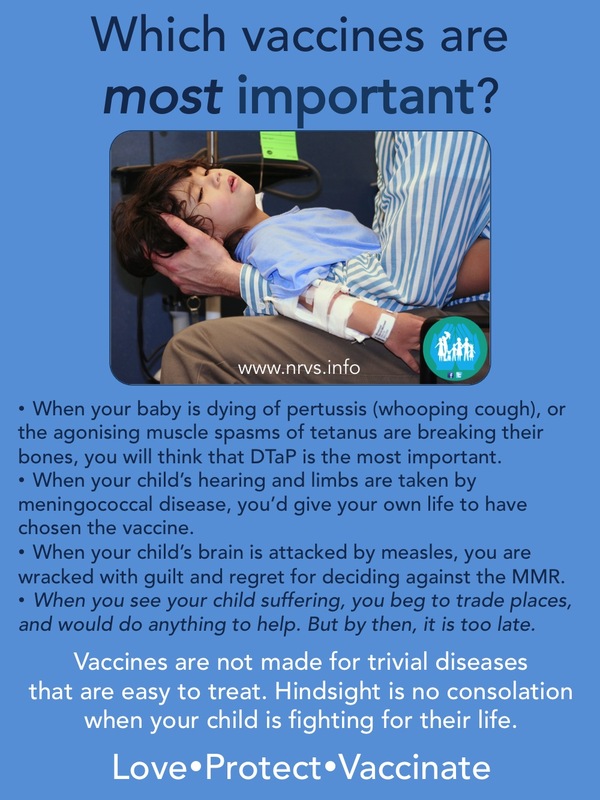 When your child’s brain and lungs are attacked by measles, and you are wracked with the guilt that you chose to leave them vulnerable, unprotected, and unvaccinated, the MMR is most important. By then it is too late. When your child is on life support with pneumonia caused by chickenpox, then the Varicella vaccination is the most important. By then it is too late. When your child is fighting to breathe and turning blue as their airway obstructs from epiglottitis you wish so hard you had chosen to get their HiB vaccination. By then it is too late. When your child calls you and tells you she has cervical cancer and has to have chemotherapy, you wonder how to tell her you could have prevented it with the HPV vaccine. By then it is too late. When you see your child suffering, you beg to trade places. You wonder how this can have happened to your healthy beautiful baby. You would do anything to be able to turn back the clock, to have your time over again, and you wish that you had chosen to protect them. None of the diseases preventable by vaccine are ones that I would choose for myself or my family, so the most important vaccine? It’s all of them. Hindsight is no consolation when you child is fighting for their life. Hindsight is no help when your child is sick and suffering because your choice left them vulnerable. Hindsight is too late when it comes to vaccine preventable disease. Vaccines are not designed for trivial diseases that are easy to treat.